Day 18: Serengeti by The Bay – The San Francisco Bay Trail: It's Closer Than You Think! Coyote Hills guided me home yesterday. I had them in my sites as I worked my way through Eden Landing yesterday and they stayed on my mind as I plodded through the final miles along Union City Blvd. They represented hope and anticipation of something new and inviting waiting for my arrival the following morning. They did not disappoint. I was joined by Team ‘N Training hiking coach, Carolyn Balling and I am pretty sure I slowed her down out there today. We met up at Union City BART and made the quick fifteen minute commute to Ardenwood Blvd. and Paseo Padre on AC Transit before tucking our Clipper Cards away and heading west along the Alameda Creek Trail and into Coyote Hills Regional Park. Within the first mile we came across not one or two white pelicans but a whole colony of several dozen crowded onto a small island several hundred yards off the trail and too far for my zoom lens to capture a quality image to share with you. Trust me, I tried, however the best images are cemented in my memory only. The wetlands approaching the hills for which this regional park is named, is home to a variety of birds and ducks and I apologize for not having the background to fully give them justice. So just trust me, bring your Audubon Society guide books and bird scopes and knock yourself out. You will not be disappointed even this time of year – however those “in the know”, know that true bird watching season out on the Bay Trail is during migration season. But if you want to watch the locals, now is as good a time as any. Speaking of locals, Carolyn and I decided to try a narrow trail leading up to the first peak we would ascend and came across a man with his tripod firmly set on the hillside and aimed at a tree we were about to climb/walk under. Naturally, we looked up and saw, to our amazement, two great horned owls – a mother and her chick – perched high in the tree. They were both plump and healthy, no doubt the result of the robust ground squirrel population. In hindsight there were not too many ground squirrels around us at that point but I did come across the tail end of a skunk scuttling into some bushes on the hillside a short while later. We summited the first hill – an intimidating 265 feet above sea level – within a few minutes of leaving our owl friends as well as the nice man who shared the moment with us. The views from the top extended in every direction and gave us the perfect vantage point to take in everything from the old salt ponds just below us to the coastal mountains across the bay and Mission Peak to the east. Coyote Hills has it all. Everything I bore witness to since May 31st – with the exception of the more urban landscapes – seemed to congregate in this one area. Just about every bird species I came to recognize over the past few weeks is here. 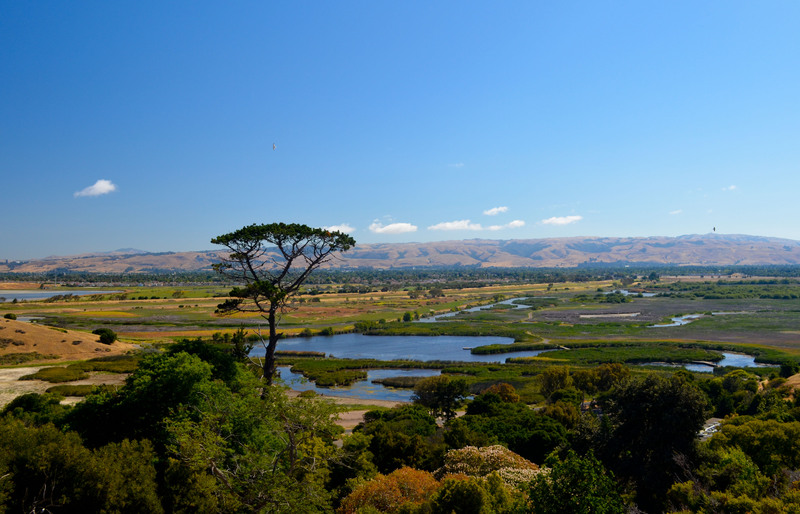 While we hiked in from Ardenwood and Alameda Creek, the hills and wetlands are readily accessible from the visitor’s center in the center of the park. After eating an early lunch we made for the road and what lay ahead which was about six miles of Bay Trail that runs along busy surface streets. However the Bay Trail is a constant work in progress and there is a planned trail through the Don Edwards National Wildlife Refuge, just west of these streets which will then connect the trail to Milpitas and eventually around the horn to Alviso Park in San Jose. However, if you want to get your fill of trails, scenery and wildlife in one swig of the canteen you need not venture further than Coyote Hills.